China Mobile, one of the three Chinese telecom operators, and Shanghai Pudong Development Bank (PDB) jointly launched a SIM-based NFC payment solution. It’s for free for any China Mobile user to replace the SIM card in his/her phone for a NFC payment-enabled one. Now the card is available in three cities, Shanghai, Guangzhou and Changsha. In August PDB will have its branches in 28 provincial regions help users get the new SIM card. 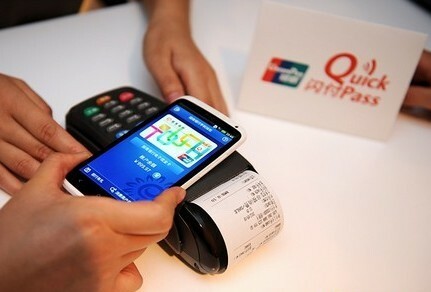 Tapping to pay with such a SIM card-powered smartphone in a convenience store or at a vendor machine is supported by QuickPass POS which is supplied by China UnionPay, China’s bankcard association. There are reportedly 1.2 million such devices in China. Other services include mobile phone billing and bank account checking. It will support bus, subway and taxi by the end of this year, according to a PDB representative. The SIM card has been compatible with three more banks, China Merchants Bank, China CITIC Bank and China Everbright Bank, and is capable to store more than 20 bank card details. PDB rolled out the first mobile payment service in 2011 and now has 900 thousand users making mobile payments with the service. The cooperation with China Mobile must bring PDB users quickly. And the deal couldn’t be possible if China Mobile didn’t dump its self-developed mobile payments technology for the one adopted by China UnionPay and the rest of the world in late 2012. But still, the one problem is there is a limited number of NFC-enabled phone models.